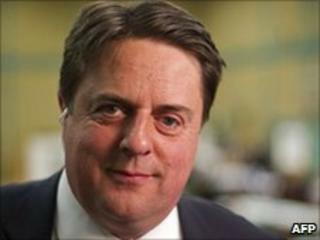 British National Party leader Nick Griffin has said he intends to accept an invitation to attend a garden party at Buckingham Palace this summer. He received the invitation in his capacity as a member of the European Parliament (MEP) - all UK MEPs are asked as a matter of course. Mr Griffin was set to attend a similar party last year but pulled out after an outcry over his possible appearance. A Labour MP has described the idea of Mr Griffin attending as "sickening"
Mr Griffin failed in his attempt to win a seat at Westminster in last month's general election and the party's share of the vote fell sharply compared with its performance in European elections a year earlier. British MEPs get tickets to one of three royal garden parties held every summer. Buckingham Palace confirmed that Mr Griffin had been invited but did not say to which of the events. Mr Griffin said he planned to go along, telling the BBC that the "the sky wouldn't fall in" if he did so. The BNP leader will be accompanied by family members after his request for three additional guest tickets was granted. Labour MP Margaret Hodge, who defeated Mr Griffin at the election, said she was dismayed at the prospect. "It sickens me that Nick Griffin has used his position as an elected representative to secure an invitation to Buckingham Palace," she said. "The best way to deal with the BNP is the way we dealt with them in Barking & Dagenham, which is to beat them at the ballot box." The BBC's Royal Correspondent Peter Hunt said critics had so far stopped short of calling on royal officials to reconsider inviting him. However, he added that for the second time in a year what is a genteel social occasion - whose participants reflect the diversity of the UK's population - is taking on a political dimension. Although Mr Griffin was not an MEP at the time, he was invited last year as a guest of BNP colleague and London Assembly member Richard Barnbrook. The possibility of him being present prompted widespread criticism, with London Mayor Boris Johnson saying the BNP leader would use the event as a "political stunt". Mr Griffin said he could have secured a "great deal of publicity" by attending but had decided against it - although he described political reaction to the issue as "hysterical". The BNP, which has two MEPs, is accused of stirring up racial hatred but the party says it is standing up for Britain's "indigenous population". It has campaigned for an end to all future immigration and for the "voluntary resettlement" of non-white British citizens to their country of ethnic origin.